The sun is fun. I know. I know. I could live on the beach for 60 straight days and not complain once. But my hair would fall off one strand at a time … which would not be cute. If you spend a lot of time at the beach / pool – you need to worry about your locks! Don’t think a regular conditioner is enough during the warmer months. 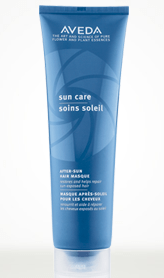 Aveda has a Sun Care After-Sun Hair Mask … err … Masque that I want to put on your radar. The intensive cream masque restores sun-exposed hair, moisturizes, and helps defend against free radicals. Ingredients like tamanu oil, certified organic shea butter, coconut and palm oils help moisturize your hair. HOW TO USE: Use after shampooing with Sun Care Hair and Body Cleanser. Apply evenly to damp hair, roots to ends. Leave in 2-5 minutes. Rinse thoroughly. Use weekly or whenever hair is exposed to sun, salt and chlorine.